The Empress is, after The High Priestess, another feminine card. There is definitely a maternal feeling, and with the early Major Arcana, has a positive feel of creation, bonding and love. We’ve selected live tarot readers to give you a FREE 3 Minute interpretation of The Empress! Scroll through them below and pick your favorite one. Past – The Empress in the Past position represents a past female influence. This could be anything from a role model to mother, or even a bully, but the aspect to identify is that it is still having an impact on you and should be dealt with. If asked in regards to your family, it could be related to your Mother. If you’re asking about education or work, it could be that a female teacher or colleague is having an influence on you. Romance isn’t implied, but don’t ignore it. 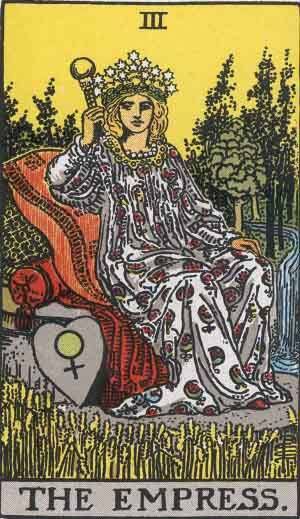 Present – The Empress in the present position represents a new beginning, but not in the sense of starting right away. You may have just completed a task and are looking for the next project to work on. It’ll come. You could be bored and unsatisfied in your life. The maternal feeling in the card is strong, so maybe an older, more experienced feminine person can aid you. Future – The Empress in the future position is the best position it can land in. Are you in a relationship now? If so, you or your partner is ‘becoming’ The Empress. This is a good sign. If you’re asking about work, it could be that things will pan out, eventually, and reach a comfortable plateau. Work / Education – The Empress is positive in regards to work. People will look up to you. You could lead a project and people will work with you on it. This could be in your main job or a side project. Not a time to be aggressive, let things flow naturally. Romance – The Empress is highly positive. You could meet the person you will be with forever soon, if you are single. If you’re in a relationship, it can only mean good things. You will mature as a person and your relationship will be all the better for it. Are you trying for a baby? It’s a good time to! Friends – The Empress in regards to friendship could mean that you might be moving into a more central part of your friendship group. You might have a leader role when it comes to some activity, or another aspect where people are going to have to rely on you. Money – The Empress is positive in regards to wealth. Your finances are growing, but share the wealth. Don’t keep it hidden, after all, it’s only money, the true wealth is the potentiality of money. Health – The Empress gives you wisdom in regards to health. You might suffer from something that you have in the past, possibly something like a cold or flu. As mentioned above, this is a good time for pregnancy. Spirituality and Mentality – The Empress has the wisdom of an experienced mother within her, so now might be a good time to discuss your spiritual beliefs with others. A distinctly feminine card in almost every aspect; a woman, the Venus symbol, a flowing river. The heart shaped again shows Venus, the goddess of love. The aspect of the mother is present too, she sits in a field of corn, and her dress is adorned with fruits (much like the design of the veil on The High Priestess). The Empress in reverse could show a lack of growth in different aspects of your life, through either stagnation or lack of encouragement. Expect a period of poverty, in the sense that you will be lacking in the things which you desire. Consider if your lack of growth is being caused by your own influence, or if somebody else is putting it on you, especially somebody in authority who should be your guide and mentor.